Anita Thompson, bestselling author of The Gonzo Way, and wife to the late Hunter S. Thompson, began working as his assistant in 1999. In 2000, she moved in and three years later they were married. Today, she is the director of the Gonzo Foundation Owl Farm Blog. 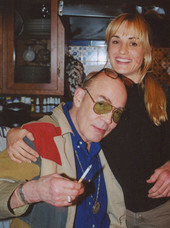 Anita has published a second book, Ancient Gonzo Wisdom: the Selected Interviews of Hunter S. Thompson. She graduated from Columbia University in American Studies. Anita Thompson continues to work in Hunter’s stead and live on Owl Farm in the little town of Woody Creek outside of Aspen, Colorado.